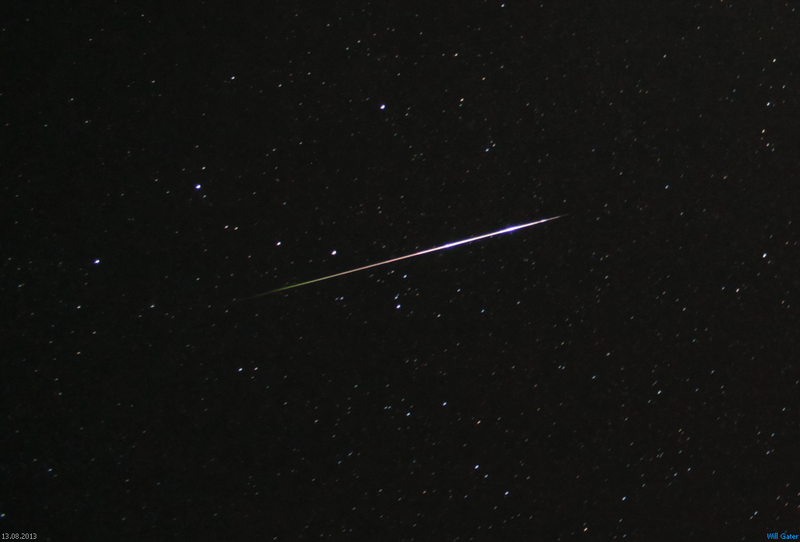 The skies were mostly clear in southern England for the peak of the Perseid meteor shower last night. Here are a few pictures that I captured of the display from the countryside to the east of Bristol. Despite the short nights, and often poor weather, the summer night skies offer some spectacular celestial sights. My favourite areas to observe at this time of year are the rich swathes of the Milky Way in Cygnus, Sagittarius and Scutum. These regions are packed with dense starfields, glowing emission nebulae and some of the night sky’s finest star clusters. 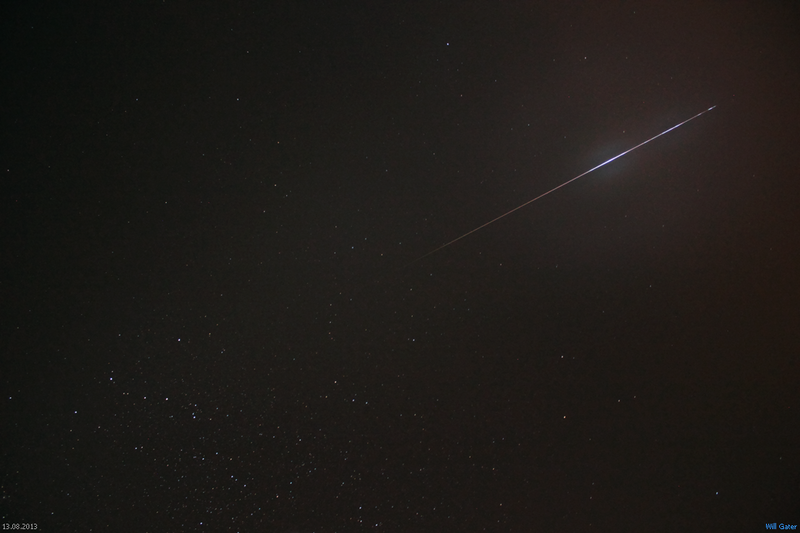 On Saturday I spent the evening on Dartmoor imaging these wonderful parts of the sky. I wanted to capture a large portion of them in each frame, so I used a 50mm prime lens on my unmodified Canon 550D DSLR, which itself was mounted on an HEQ5 Pro mount. The first image below shows part of the Sagittarius, Scutum & Serpens region. Several Messier objects are visible in the frame, including: M8 (the Lagoon Nebula), M20 (the Trifid Nebula), M22, M17, M16 (The Eagle Nebula) and M24. The second shot shows a region of the Milky Way in the constellation of Cygnus. The red glow of the North America Nebula (NGC 7000) and the nebulosity around the star Sadr (right of centre) are apparent. You can also, just, make out the two main fragments of the Veil Nebula right on the very bottom edge of the frame. The shot with the silhouetted tree is a single 15-second exposure, at ISO 1600, with the lens wide open at f/1.8. The Story of a Shooting Star – filming begins! Over the last 12 months I’ve been working, in my spare time, on a short film about meteors. Called The Story of a Shooting Star it “follows the journey of a tiny grain of space dust, tracing its origins all the way back to the birth of the Solar System before exploring its final fleeting moments blazing across the night sky as a meteor”. Having spent a while scriptwriting and researching I recently started filming for the project. In May I spent a fascinating day at the Norman Lockyer Observatory, in Devon, with the Solar, Planetary & Meteor group there learning about radio meteor detection. And this past weekend I filmed in the stunning surroundings of Dartmoor National Park. I’ll be posting occasional updates on the film (and hopefully some short clips too) here, but for now here are some pictures from the first few days of location shooting. I’ve just spent the last week staying very near to Galloway Forest Park, along with my wife and a few of our friends. I’ve been meaning to visit the forest ever since it was declared the UK’s first International Dark Sky Park back in 2009. The night skies were truly incredible and we were lucky enough to have 4.5 clear nights out of seven. I’ve put together a series of photographs below that show the astronomical highlights of our trip, including several sightings of Comet C/2011 L4 (PANSTARRS). 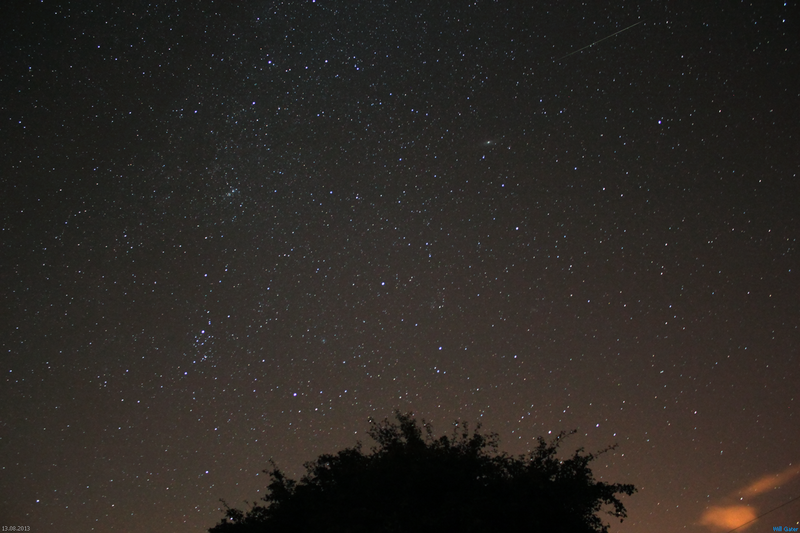 If you’d like to find out more about Galloway Forest Park’s dark skies check out this page. I had great fun on Wednesday night in the Brecon Beacons filming a series of live segments about astrophotography for the BBC’s The One Show. The idea behind the evening was that I would help a group of twenty amateur photographers take their first images of the night sky before judging which was the best shot. When we arrived at the filming location the sky was filled with clouds, but as the Sun set the clouds thankfully dissipated and the photographers managed to capture their pictures (even despite some quite substantial haze). If you missed the programme, and are in the UK, you’ve got a few days left to catch it on the BBC’s iPlayer; the astrophotography bits can be found here, here and here. And if you’ve captured an astro image lately that you’re particularly pleased with, don’t forget to send it into the 2013 Astronomy Photographer of the Year competition, which is now open for entries. Over the last few nights we’ve had some clear skies and good seeing conditions here in the southwest of the UK. 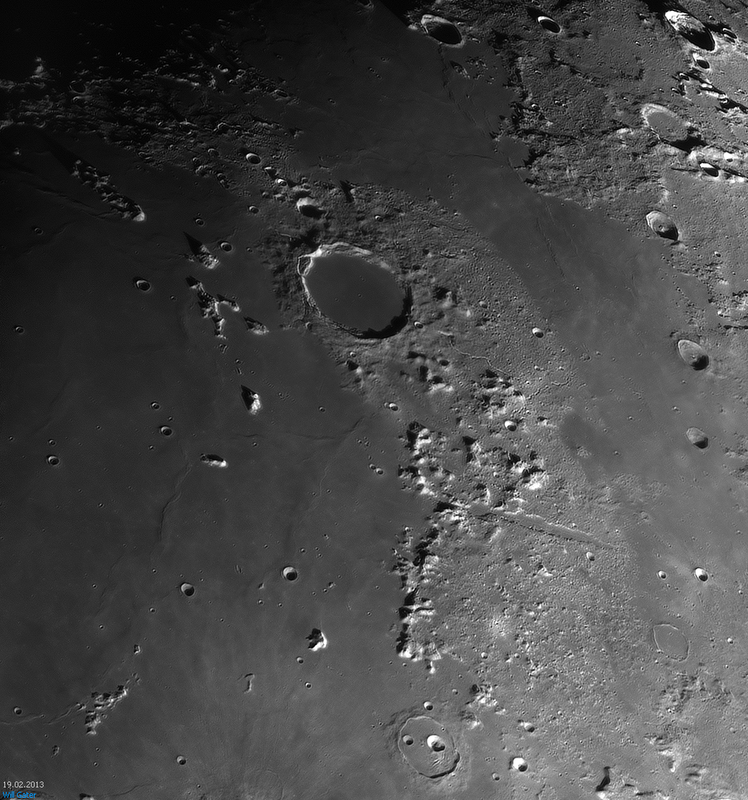 On Monday night I spent 3 hours capturing a 50 pane mosaic of the whole of the visible portion of the Moon while last night I decided to focus on the wonderfully rugged region around the lunar Alps and the crater Plato. Both images are shown below – do click on them to see the full size versions, especially the whole-phase mosaic. 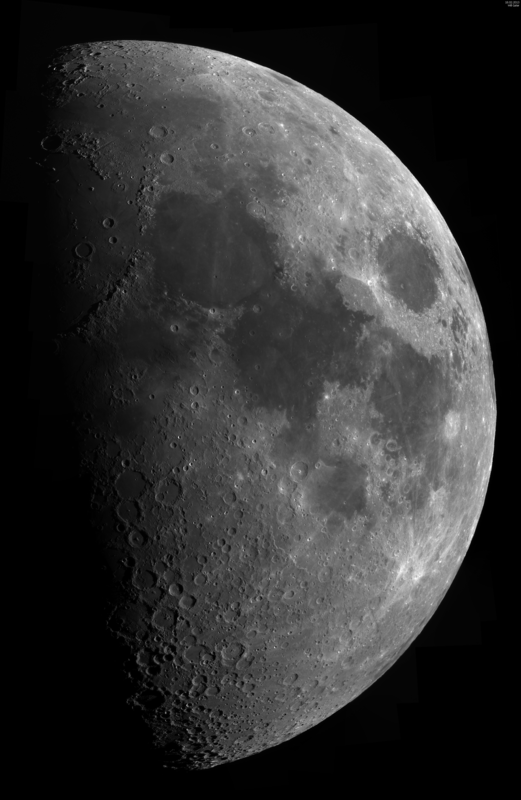 They were captured with a Meade 8-inch LX200R Schmidt-Cassegrain telescope and an Imaging Source DMK21AU618.AS CCD camera; the Plato/lunar Alps image is a mosaic of 17 panes made using an additional 2x Barlow lens.